ABSTRACT. The effect of thiamine (vitamin B1) or riboflavin (vitamin B2) availability on fasting total homocysteine (tHcy) plasma levels in end-stage renal disease patients is unknown. A cross-sectional study was performed in a population of non–vitamin supplemented patients maintained on continuous ambulatory peritoneal dialysis. Red blood cell availability of thiamine (α-ETK) and of riboflavin (α-EGR), along with other predictors of tHcy plasma levels, was considered in the analysis. There was a linear association of α-EGR with tHcy plasma concentrations (P = 0.009), which was not observed for α-ETK. Among red blood cell vitamins, α-EGR was the only predictor of tHcy levels (P = 0.035), whereas α-ETK, red blood cell pyridoxal-5-phosphate supply (α-EGOT) and red blood cell folate levels had no effect. The risk for having a high tHcy plasma levels within the fourth quartile (plasma tHcy >38.3 μmol/L) was increased by an α-EGR > median (odds ratio, 4.706; 95% confidence interval, 1.124 to 19.704; P = 0.026). By way of contrast, α-ETK had no effect in these analyses. Independent predictors of tHcy plasma levels were serum albumin, α-EGR, red blood cell folate, and certain MTHFR genotypes. A logistic regression analysis showed that the MTHFR genotype is a predictor for having a tHcy plasma concentration within the fourth quartile. In summary, riboflavin availability, as measured by α-EGR, is a determinant of fasting tHcy plasma levels in peritoneal dialysis patients. This finding may have implications for tHcy lowering therapy in individuals with end-stage renal disease. The majority of patients with impaired renal function present elevated total homocysteine (tHcy) plasma levels (1). Established predictors of tHcy plasma levels in the renal failure population include serum albumin and serum creatinine levels, creatinine clearance, folate status, vitamin B12 and vitamin B6 levels, as well as genetic variants in enzymes involved in the folate cycle or in the remethylation of homocysteine (2–7). An elevated tHcy plasma level can indicate folate and/or vitamin B12 deficiency (8) and is associated with a variety of pathologic conditions such as vascular disease (9–11) or birth defects (12). Although genetic and nongenetic factors have been shown to determine tHcy concentrations of patients with renal insufficiency, the cause of hyperhomocysteinemia among these patients is not completely understood (13). The role of B-group vitamins other than vitamin B6 or vitamin B12 as determinants of hyperhomocysteinemia in the general population and in the setting of renal insufficiency is far from clear, although vitamin B1 (thiamine pyrophosphate) and vitamin B2 (riboflavin) are involved in the metabolism of methionine and homocysteine. We assumed that thiamine or riboflavin availability is a predictor of fasting tHcy plasma levels in end-stage renal disease (ESRD). To test this hypothesis, we performed a cross-sectional study among a population of non–vitamin supplemented patients maintained on continuous ambulatory peritoneal dialysis (CAPD). Red blood cell availability of thiamine and of riboflavin, along with other important predictors of tHcy plasma levels, was considered in the analysis. In a cross-sectional study, the association of red blood cell availability of thiamine (α-ETK) and riboflavin (α-EGR) with tHcy levels was evaluated in stable peritoneal dialysis patients. Erythrocyte pyridoxal-5-phosphate availability (α-EGOT), red blood cell folate, plasma folate, plasma vitamin B6, plasma vitamin B12, and MTHFR genotypes were also determined. We included all patients in our study who were on peritoneal dialysis treatment at the Division of Nephrology and Dialysis, Department of Medicine III, University of Vienna for at least 3 mo. Exclusion criteria comprised time on peritoneal dialysis of less than 3 mo, acute illness, current vitamin supplementation, or participation in other clinical studies. The ethical review board at the University of Vienna approved the study. All patients gave written informed consent according to the Declaration of Helsinki and the Austrian Law on Gene Technology. Blood was drawn for all analyses after an overnight fast. Whole blood counts and blood and dialysate chemistry were performed by standard methods. For determination of red blood cell folate, plasma tHcy, plasma folate, plasma vitamin B6, and plasma vitamin B12, blood anticoagulated with ethylenediaminetetraacetic acid (EDTA) was drawn, immediately placed on crushed ice, and protected from light. Blood aliquots were snap frozen at −70°C for extraction of DNA. Blood aliquots for determination of red blood cell folate concentrations were hemolysed with 0.2% ascorbic acid (1:21) for 2 h and frozen at −70°C. Red blood cell folate was determined using a radioassay (SimulTRAC-SNB; ICN Pharmaceuticals Inc., Costa Mesa, CA) according to the instructions of the manufacturer (red blood cell folate [nmol/L of packed red blood cells] = [(hemolysate folate concentration) × 21]/[hematocrit (in decimal notation)]; normal, >272 nmol/L). The remaining EDTA-anticoagulated blood samples were centrifuged within 30 min at 2.000 × g at 4°C (20 min). Plasma aliquots were snap frozen and stored at −70°C. Fasting tHcy plasma concentrations were determined by a fluorescence polarization immunoassay (IMx analyzer; Abbott Laboratories, Abbott Park, IL). Hyperhomocysteinemia was defined as tHcy plasma levels >15 μmol/L (14). Folate (normal, >3.4 nmol/L) and vitamin B12 (normal, >118 pmol/L) plasma levels were measured with a radioassay (SimulTRAC-SNB, ICN Pharmaceuticals Inc.). Vitamin B6 plasma levels (normal, >20 nmol/L) were determined with a radioenzymatic assay (Bühlmann Laboratories AG, Allschwil, Switzerland). For examination of thiamine-, riboflavin-, and pyridoxal-5-phosphate status of red blood cells, blood anticoagulated with heparin was drawn and incubated in melting ice for 15 min. After centrifugation at 2.000 × g for 20 min at 4°C, red blood cells were washed thrice with 0.9% saline (centrifugation for 10 min; 2.000 × g; 4°C). For analysis of thiamine status, 400 μl of the pellet were diluted with 360 μl of saline and stored at −70°C. For analysis of riboflavin and pyridoxal-5-phosphate supply, 200 μl of pelleted red blood cells were diluted with 900 μl of saline and stored at −70°C. Thiamine status was assessed by determination of erythrocyte transketolase activity (ETK) without (ETKo) and with addition of thiamine diphosphate (ETK+) (15). The ratio of enzyme activity after and before addition of thiamine is given as α-ratio (α-ETK; adequate thiamine status, <1.18) (16). Riboflavin supply was evaluated by measuring erythrocyte glutathione-reductase (EGR) activity without (EGRo) and after addition of flavin adenine dinucleotide (EGR+) (17–19). The ratio of enzyme activity after and before addition of the vitamin is indicated as α-ratio (α-EGR; adequate riboflavin status, <1.52) (16). For estimation of pyridoxal-5-phosphate supply, erythrocyte glutamic-oxaloacetic transaminase activity (EGOT) was determined (20). The α-ratio (α-EGOT; adequate pyridoxal-5-phosphate status, <1.8) (16) was calculated from enzyme activity after (EGOT+) and before (EGOTo) addition of pyridoxal-5-phosphate. Identification of the 677C→T transition and of the 1298A→C transversion in MTHFR was performed by restriction fragment length polymorphism analysis (21,22). Weekly Kt/V, residual renal clearance, and characterization of the peritoneal transport type was performed as previously reported (4). Continuous data are given as mean ± SD. Categorical data are given as absolute counts and percentages. Nonadjusted tHcy plasma levels are given across the quartiles of thiamine, riboflavin, pyridoxal-5-phosphate, plasma vitamin B12, and whole blood folate. Differences were examined by ANOVA. Correlations were assessed by Pearson correlation coefficient. A four-way ANOVA model was built to examine the association of red blood cell vitamin supply (covariables: α-ETK, α-EGR, α-EGOT, and red blood cell folate) with tHcy plasma levels. The proportion of patients with poor vitamin supply (vitamin level ≤ median or α-ratio > median) among subjects presenting with tHcy plasma levels in the fourth quartile was compared with the proportion of patients with tHcy plasma levels in the first three quartiles showing poor vitamin supply by χ2 test. The risk (odds ratio and 95% confidence interval) for a tHcy level within the fourth quartile (>38.3 μmol/L) was calculated for poor supply of thiamine, riboflavin, pyridoxal-5-phosphate, plasma vitamin B12, and red blood cell folate. A multiple linear regression model was built to examine independent predictors of tHcy plasma concentrations. tHcy measurements were positively skewed; therefore, natural logarithmic transformation was used to normalize the distribution. This model included all variables that showed a linear association with tHcy plasma concentrations (serum creatinine, serum albumin, red blood cell folate, and α-EGR) as well as a MTHFR (677/1298) TT/AA, CT/AC genotype yes/no term. A logistic regression analysis was performed to identify independent predictors of tHcy plasma levels in the upper quartile as compared with the first three quartiles. α-ETK, α-EGR, α-EGOT, red blood cell folate, plasma vitamin B12 levels, as well as albumin, creatinine, and a MTHFR (677/1298) TT/AA, CT/AC genotype yes/no term were included as independent variables. All analyses were performed using SPSS for Windows (Version 10.0.7; SPSS, Chicago, IL). Fifty-four (28 female patients and 26 male patients) of 62 eligible peritoneal dialysis patients were included in this study (three patients participated in other clinical studies, four patients had high-dose vitamin supplementation, and one patient refused to participate). Recruitment of patients was performed between November 2000 and March 2001. The mean age of these patients was 54.4 ± 15.1 yr, and the duration of dialysis treatment was 1.8 ± 1.5 yr. The mean weekly Kt/V was 2.43 ± 0.49, the mean protein catabolic rate was 0.92 ± 0.19 g/kg per d, and the mean dialysate/plasma ratio of creatinine was 0.63 ± 0.16 (32 low-low average transporters and 22 high-high average transporters). The mean serum albumin was 33.7 ± 3.8 g/L, the mean serum creatinine was 7.9 ± 2.3 mg/dl, and the mean hemoglobin concentration was 11.5 ± 1.4 g/dl. The mean body mass index was 23.7 ± 3.6 kg/m2. There were 20 smokers, and 10 patients presented with diabetes mellitus. Dialysis treatment was initiated because of ESRD due to shrunken kidneys of unknown etiology (n = 24), diabetic nephropathy (n = 10), polycystic kidney disease (n = 8), chronic glomerulonephritis (n = 7), chronic interstitial nephritis (n = 2), hemolytic uremic syndrome (n = 1), juvenile nephronophthisis (n = 1), and Alport syndrome in one case. Thirty patients were maintained on CAPD, and 24 were treated with automated peritoneal dialysis (APD), including 16 patients on continuous cyclic peritoneal dialysis (CCPD) and 8 patients on nightly intermittent peritoneal dialysis (NIPD). None of the patients included in this study received folic acid or B vitamin supplementation. Fifty patients were on regular therapy with recombinant human erythropoietin and intravenous iron sucrose. Two patients were on erythropoietin therapy alone, and another two patients were on iron therapy without erythropoietin. Vitamin dependent enzyme activities in red blood cells (α-ETK, α-EGR, α-EGOT), red blood cell folate, vitamin plasma levels, and tHcy plasma levels are given in Table 1. Vitamin B1 deficiency (α-ETK ≥1.18) was present in five patients, vitamin B2 deficiency (α-EGR ≥1.52) in 10 patients, and vitamin B6 deficiency (α-EGOT ≥1.8) in 46 patients. Low plasma levels of vitamin B6 (<20 nmol/L) were observed in 25 patients. Plasma folate and red blood cell folate was normal (>3.4 nmol/L and >272 nmol/L, respectively) in all patients, and vitamin B12 plasma levels were low (<118 pmol/L) in three patients. Normal tHcy plasma levels were present in six patients. Moderate (16 to 30 μmol/L), intermediate (31 to 100 μmol/L), and severe (> 100 μmol/L) hyperhomocysteinemia was detected in 31, in 14, and in three patients, respectively. The MTHFR 677/1298 TT/AA genotype was identified in five patients, and the CT/AC genotype in 18 patients. Regression analysis showed a linear association of riboflavin supply (r = 0.351; P = 0.009), of red blood cell folate (r = −0.338; P = 0.013), and of folate plasma levels (r = −0.284; P = 0.037) with tHcy plasma levels. The association of tHcy plasma levels with α-EGR is shown in Figure 1 (excluding one outlier). There was also a positive association of creatinine and albumin levels with tHcy plasma concentrations. Red blood cell thiamine supply, red blood cell pyridoxal phosphate supply, vitamin B12 plasma levels, and vitamin B6 plasma levels showed no association with fasting tHcy plasma concentrations in this analysis. Figure 1. Linear association of red blood cell riboflavin supply (α-EGR) and plasma homocysteine (tHcy) concentration in 53 peritoneal dialysis patients (one extreme outlier was omitted). The tHcy plasma levels according to quartiles of vitamin supply are given in Table 2. Poor red blood cell folate, plasma vitamin B12, and red blood cell vitamin B2 supply was associated with increased tHcy plasma concentrations. A four-way ANOVA showed that riboflavin supply, as determined by α-EGR, is the most important predictor of tHcy levels among red blood cell vitamins (Table 3). The other variables, namely α-ETK, α-EGOT, and red blood cell folate showed no effect on tHcy concentrations in that model. There were significantly more patients with an α-EGR > median, with a vitamin B12 plasma level < median, or with a red blood cell folate < median among individuals with tHcy plasma levels in the upper quartile (Table 4). A multiple linear regression model showed that serum albumin levels (P = 0.001), α-EGR (P = 0.043), red blood cell folate (P = 0.001), and the MTHFR genotype (P = 0.007) are independent predictors of tHcy plasma concentrations. Serum creatinine had no major effect on tHcy concentrations in this model (P = 0.091). Logistic regression analysis demonstrated that the MTHFR genotype is an important predictor of high tHcy plasma levels in the upper quartile (regression coefficient, 3.228; P = 0.027), whereas all other variables in this analysis showed no effect on high tHcy plasma levels. Vitamin B1 and vitamin B2 are involved in the metabolism of methionine and homocysteine and may therefore influence tHcy plasma concentrations. Methionine can be catabolized via the transamination pathway by oxidative decarboxylation to 3-methylthiopropionate (23). Thiamine pyrophosphate, the active form of thiamine, is a cofactor of this supposed rate-limiting oxidative decarboxylation and thus may contribute to lowering of tHcy plasma levels by lowering of methionine (24). Furthermore, suboptimal supply of riboflavin, a precursor of flavin adenine dinucleotide (FAD), may also enhance the risk for hyperhomocysteinemia. Flavin adenine dinucleotide is a cofactor of the enzyme 5,10-methylenetetrahydrofolate reductase (MTHFR), which produces the active form of folate, 5-methyltetrahydrofolate, required for remethylation of homocysteine to methionine. Interestingly, mutation in bacterial MTHFR was shown to affect FAD dissociation kinetics (25). In addition, MTHFR is among the flavoenzymes that are most sensitive to impaired riboflavin status (26). Thus, riboflavin availability may be of importance in renal failure, where tHcy plasma levels are sensitive to mutations in MTHFR and to low folate levels. A few studies indicated that a low dietary intake of thiamine and riboflavin is associated with an elevation of tHcy plasma levels in subjects without renal failure (27–29). In the physician health study, a negative correlation of vitamin B1 and vitamin B2 intake with tHcy plasma levels was observed in healthy subjects (27). An inverse association of plasma tHcy was also found with thiamine intake and riboflavin intake among participants of the Atherosclerosis Risk in Communities (ARIC) Study (28). The fifth examination cycle of the Framingham Offspring Study suggested that riboflavin intake is a predictor of tHcy in non–vitamin supplemented people without renal failure (29). Most recently, the riboflavin plasma level was shown to be an independent predictor of tHcy plasma levels in healthy blood donors with the MTHFR 677TT genotype (30). These findings are in some contrast to results from the Health Professionals Follow-up Study that showed that there is no association of the MTHFR 677TT genotype and riboflavin intake with respect to tHcy levels among generally well-nourished men (31). So far the potential association of thiamine or riboflavin status with tHcy plasma levels has not been examined in renal failure patients. This is the first study to investigate the effect of thiamine and riboflavin availability on fasting tHcy plasma concentrations in ESRD patients treated by peritoneal dialysis. We provide evidence that riboflavin (vitamin B2) supply, as measured by red blood cell glutathione reductase activity, is a determinant of fasting plasma tHcy concentration in these patients. In contrast, availability of thiamine (vitamin B1) as measured by red blood cell transketolase activity, had no effect on fasting tHcy concentrations. In general, thiamine (32–35) and riboflavin (16,34–37) supply is considered to be normal in the majority of renal failure patients. However, some studies suggest the presence of thiamine (37–39) or riboflavin deficiency in renal failure patients (40), thus providing the rational basis for an association of vitamin B1 or B2 with hyperhomocysteinemia in ESRD patients. Furthermore, an independent graded influence within the reference interval of both vitamins on tHcy levels may be possible as was previously shown for folate concentrations or response to folic acid therapy (41,42). The results of our study, demonstrating no association of red blood cell vitamin B1 supply with hyperhomocysteinemia are in line with the observation of Franken et al. (24). In this study, no effect of vitamin B1 supplementation on tHcy levels was shown in patients with homocystinuria due to cystathionine-β synthase deficiency. Lack of effect of thiamine supply on tHcy levels in renal failure may be related to the impairment of neural tissue transketolase (43) or erythrocyte transketolase activity (44), a potential indicator of thiamine deficiency, which was ascribed to low molecular weight uremic toxins in renal failure patients. In this context, Descombes et al. (16) described an impaired basal erythrocyte transketolase activity despite normal thiamine plasma levels without improvement of transketolase activity after addition of thiamine in vitro in the majority of hemodialysis patients. This finding supports the assumption of a thiamine-independent enzyme inhibition in uremia. Nevertheless, a significant proportion of patients showed improvement of enzyme activity after addition of this cofactor in our study. 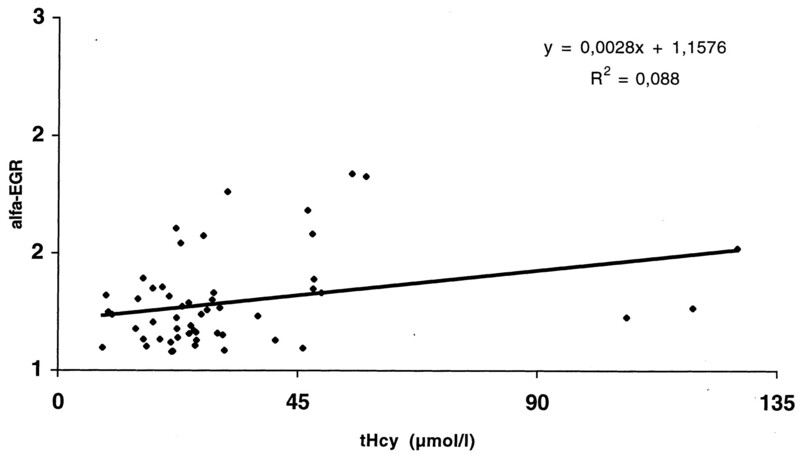 There was a positive association of α-EGR with tHcy plasma concentration (Figure 1), which resembles a negative association of riboflavin supply with tHcy plasma status because the lower α-EGR indicated a better tissue riboflavin supply. Thus, riboflavin supply was negatively associated with tHcy plasma concentrations of peritoneal dialysis patients. Interestingly, among red blood cell vitamins, riboflavin supply was the only predictor of tHcy levels in a multivariate model that included red blood cell vitamin B1 supply, red blood cell vitamin B6 supply, and red blood cell folate levels. Furthermore, the risk for hyperhomocysteinemia, presenting with tHcy plasma levels within the fourth quartile, was substantially increased by suboptimal red blood cell riboflavin supply. This finding supports the concept of Hustad et al. (30), who demonstrated an association of riboflavin plasma levels with tHcy plasma concentrations in healthy individuals. Suboptimal red blood cell folate content and low vitamin B12 plasma levels of peritoneal dialysis patients were also associated with an increased risk for fasting tHcy levels within the fourth quartile. A multivariate analysis including all variables showing associations with tHcy plasma concentrations disclosed that red blood cell riboflavin supply is an independent predictor of tHcy plasma concentrations. The majority of our patients presented poor red blood cell vitamin B6 availability. Not unexpectedly, this was not associated with fasting tHcy plasma levels. There was also no association of red blood cell vitamin B6 availability and plasma levels of vitamin B6, which may be due to uremia-related disturbances of vitamin B6 metabolism (45). A multivariate analysis showed that the MTHFR genotype is an important predictor of very high tHcy plasma concentrations, which is in line with previous observations (2,4,6,7). The findings of this study may have therapeutic implications. Supplementation of water-soluble vitamins resulted in a substantial improvement of vitamin B1 and/or vitamin B2 supply in virtually all renal failure patients (46–48). Therefore, some recommendations (49–51) included the advice to add vitamin B1 and B2 supplementation to the dietary regimen of dialysis patients, whereas others did not (52,53). On the basis of the results of this study, the effect of vitamin B2 supplementation on tHcy plasma concentrations is worth examination in renal failure patients. Importantly, there may be a permissive effect of riboflavin therapy on the tHcy-lowering effect of folate supplementation that may overcome some of the so-called folate resistance in renal failure. This assumption is based on the fact that riboflavin is the precursor of flavin adenin dinucleotide that facilitates the conversion of 5,10-methylenetetrahydrofolate to 5-methyltetrahydrofolate, which is necessary for the remethylation of homocysteine to methionine. A potential limitation to our study includes that serum levels of thiamine and riboflavin were not analyzed. We have measured supply of thiamine, of riboflavin, and of pyridoxal-5-phosphate by quantifying vitamin-dependent erythrocyte enzyme activity as α-ratio. This ratio is an indicator of the coenzyme-free apoenzymes. In case of adequate vitamin stores, the increase of enzyme activity after addition of vitamin in vitro will be small, resulting in an α-ratio near 1. In contrast, vitamin deficiency is associated with a tremendous increase of enzyme activity after addition of the vitamin in vitro, resulting in an α-ratio far above 1. The α-ETK (54), the α-EGR (55), and the α-EGOT (56) are considered to be robust and reliable measures of vitamin supply, even when compared with direct measurement of the cofactor. Furthermore, these measures have been shown to reflect also the improvement of vitamin status after supplementation in uremic patients (57,58), although uremic toxins may obscure the relation of α-ratios to vitamin status. Another point of concern may be that we have not analyzed a potential interaction of vitamin B2 supply with certain MTHFR genotypes. This was due to the small number of patients presenting with the MTHFR 677TT genotype that does not allow for this subgroup analysis. In summary, we show that riboflavin availability is a predictor of tHcy plasma levels in peritoneal dialysis patients. This finding may have implications for tHcy-lowering therapy in ESRD. The technical support of Dorota Majchrzak for the analyses of some vitamins is appreciated.